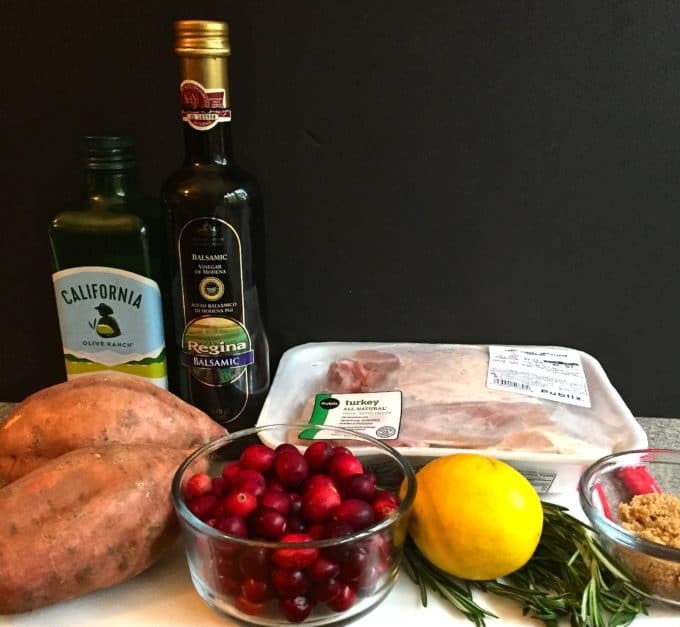 If you have a small family, Easy and healthy Turkey Skillet Dinner for Four is the answer to your Thanksgiving Dinner prayers! It’s an amazing, delicious, one-skillet turkey dinner that cooks in an hour and serves four people. Yes, you read that right! 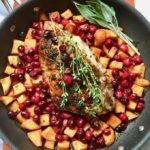 This Thanksgiving dinner menu starts off with one large skillet, a turkey breast, sweet potatoes or white potatoes, and tart mouth-watering, juicy cranberries which are roasted in a delicious wine sauce in under an hour! Sounds too good to be true? Well, believe it! This is the low-stress, easy and best of all, delicious Thanksgiving meal you have been dreaming about. 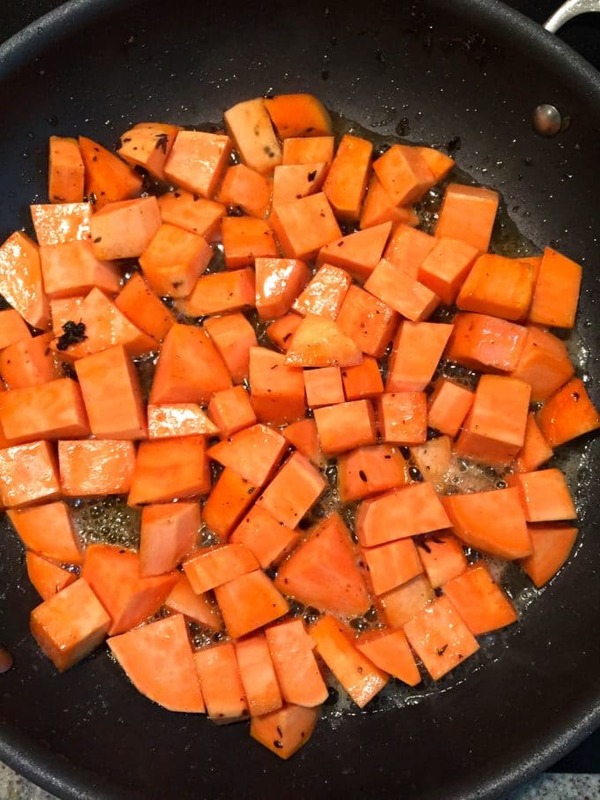 Add a few cornmeal muffins and a side salad, and you are golden! Oh, my goodness, not only is this meal delicious, it’s healthy too! I wish there were some way you could taste it or even better, smell the tantalizing aroma of the turkey cooking with the fresh herbs. No more wrestling with a large turkey and lots of side dishes, and then dealing with all the leftovers and the worse, the clean-up. You will be in and out of the kitchen in an hour and with only one pan to wash! 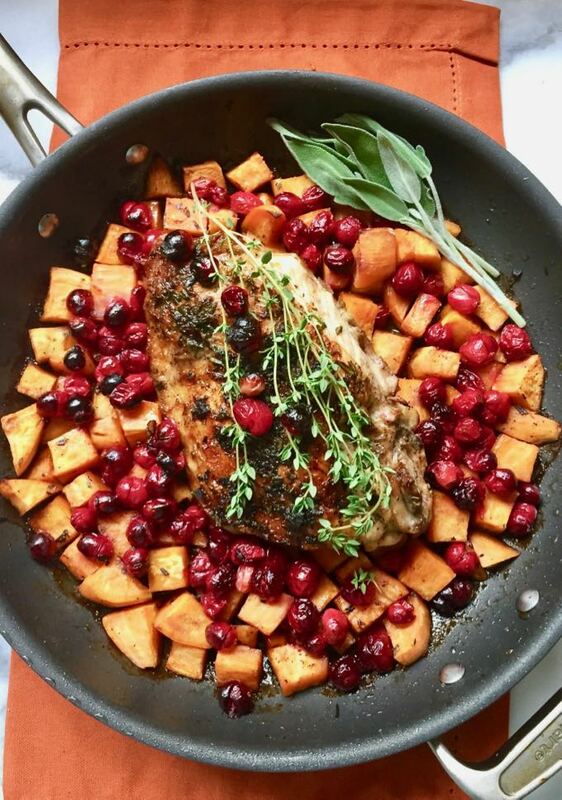 Without further ado, here is your shopping list: 1/2 of a whole bone-in turkey breast with skin (or, if you like dark meat, you can use two turkey thighs; and, of course, chicken can also be substituted), two large sweet potatoes or white potatoes, fresh cranberries, extra virgin olive oil, butter, fresh thyme, fresh rosemary, garlic cloves, a lemon, white wine or chicken broth, kosher salt and pepper, brown sugar and balsamic vinegar. Gather your ingredients and preheat the oven to 425 degrees F.
In a small bowl, mix 2 Tbsp olive oil, thyme, rosemary, lemon zest, and garlic. 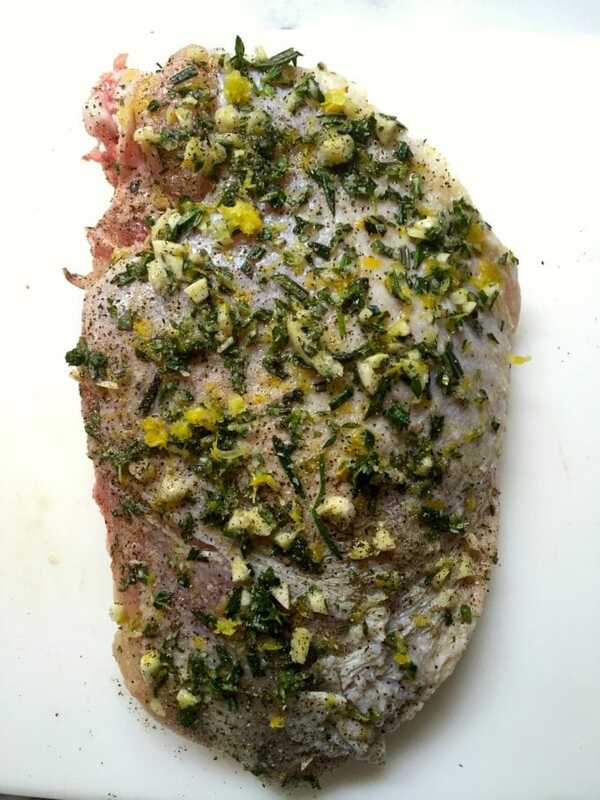 Coat both sides of the turkey with the herb mixture and season with salt and pepper. Heat a large oven-safe skillet over medium heat. Add 2 Tbsp olive oil. When the oil is hot, add the turkey breast skin side down. Cook for about 5 minutes, turn over and cook for 5 minutes longer. Remove the turkey from the skillet and set aside. Add the butter and potatoes to the skillet and cook for about 5 minutes, until they are slightly softened. Add the wine or chicken broth and cook for 2-3 minutes. 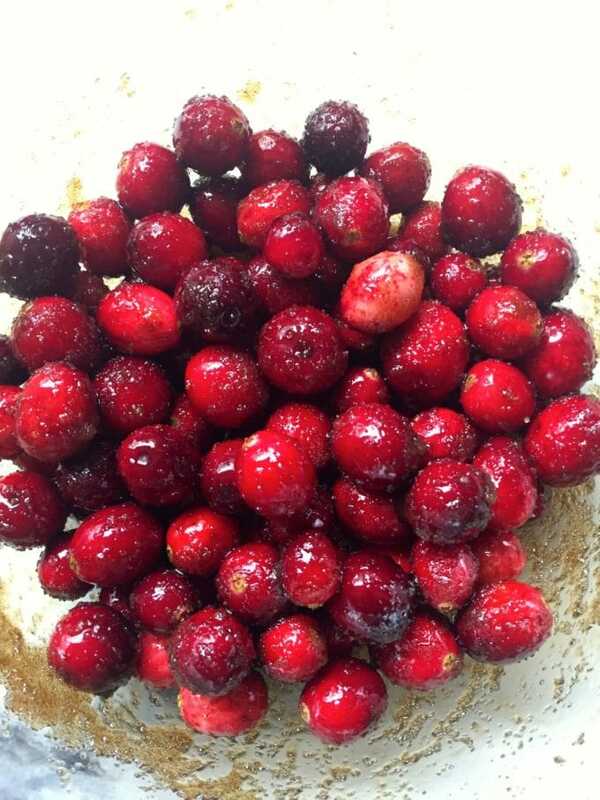 Meanwhile, mix the cranberries, lemon juice, brown sugar and balsamic sugar in a small bowl. Remove the skillet from the heat and nestle the turkey in the pan with the potatoes. Spoon the cranberries over the top. 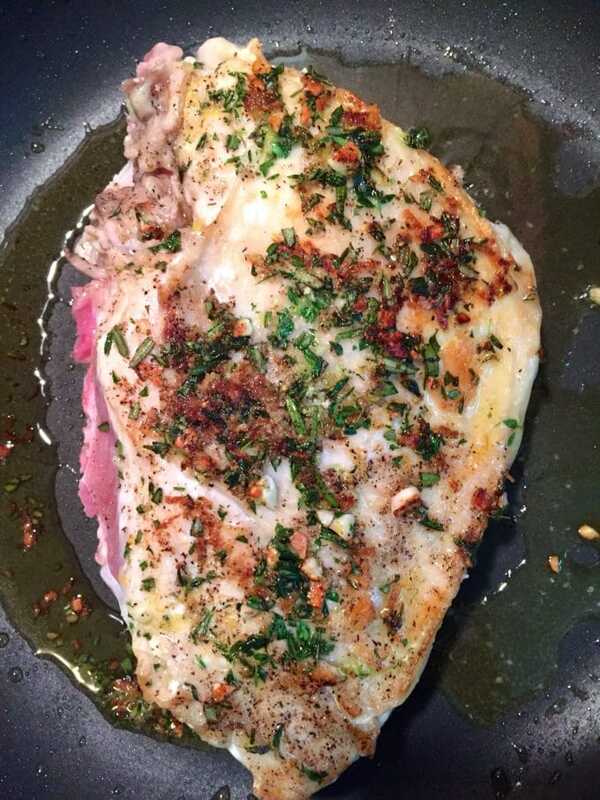 Place the skillet in the oven and roast for approximately 25-30 minutes, or until a meat thermometer reads 160 degrees F when inserted into the thickest part of the breast meat. Remove from the oven, cover and let sit about 10 minutes. Serve immediately! 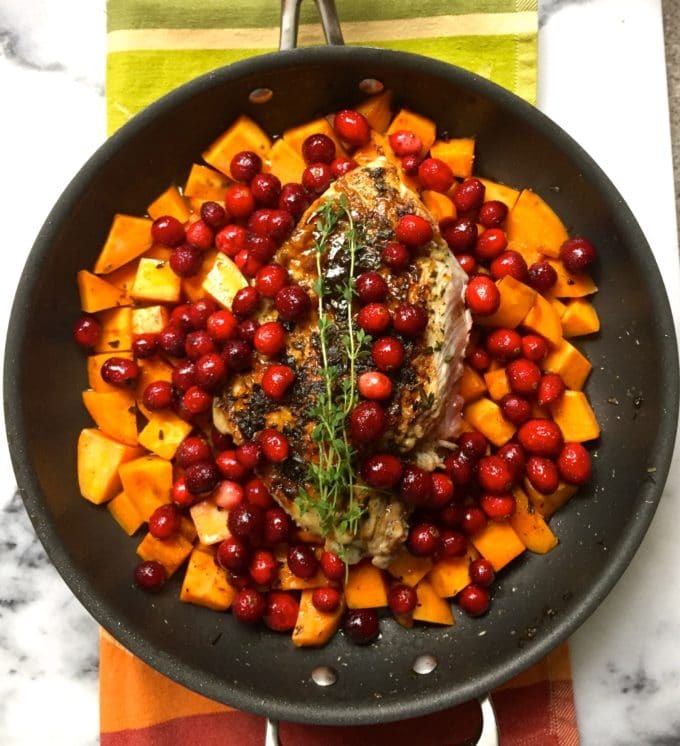 Easy Turkey Skillet Dinner for Four is the answer to your Thanksgiving prayers! 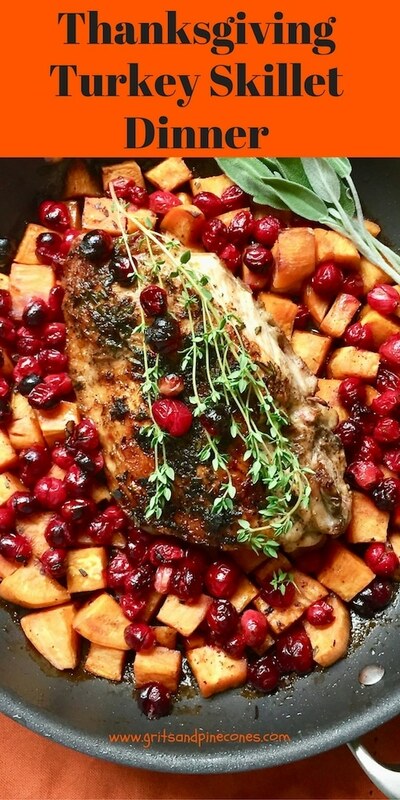 It's an amazing, delicious Thanksgiving dinner recipe that cooks in one pan! In a small bowl mix 2 Tbsp olive oil, thyme, rosemary, lemon zest and garlic. Add the butter and potatoes to the skillet and cook for about 5 minutes, until they are slightly softened. Add the wine or chicken broth and cook for an additional 2-3 minutes. This looks fabulous! my hubby and I are spending Thanksgiving by ourselves this year! I may try it out then! Thanks for the recipe!